PERT-WEEK - Doctor Who: THE PARADISE OF DEATH Review | Warped Factor - Words in the Key of Geek. Matthew Kresal looks back at the 1993 Third Doctor audio adventure. Before Big Finish started doing new stories on audio with Peter Davison, Colin Baker, Sylvester McCoy and Paul McGann, let alone Tom Baker, BBC radio had paved the way with two stories of their own. 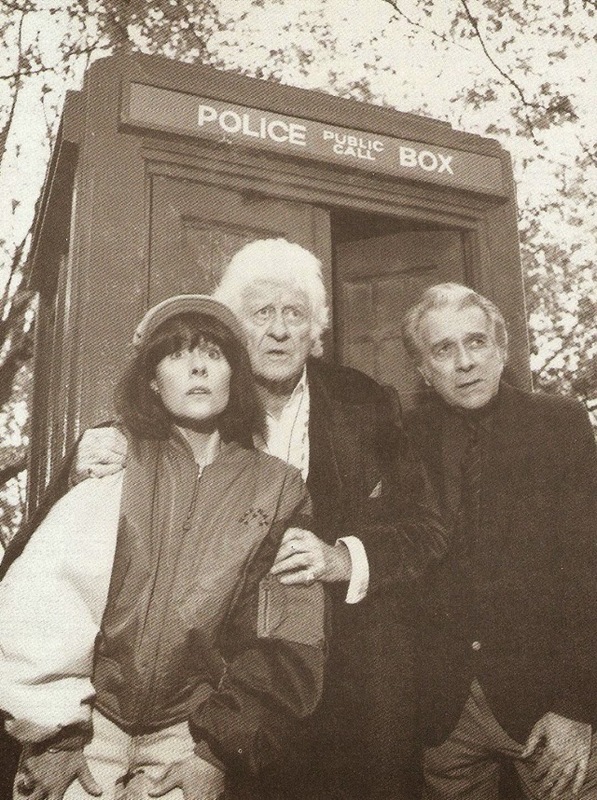 Broadcast in 1993 and 1996, respectively, those adventures reunited Jon Pertwee’s Third Doctor with Elisabeth Sladen as Sarah Jane Smith and Nicholas Courtney as Brigadier Lethbridge-Stewart. 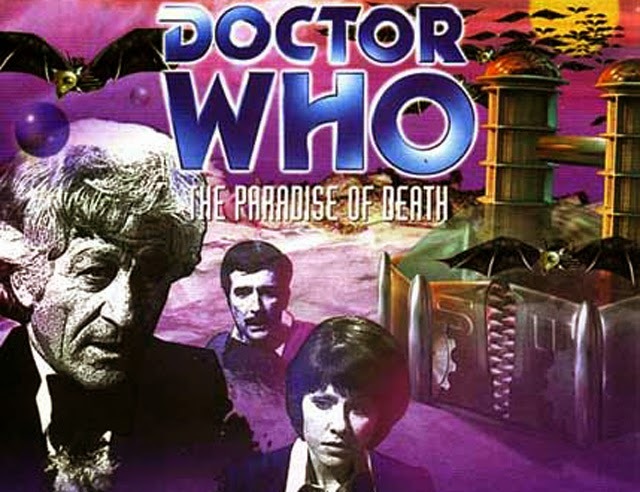 The first of these was The Paradise Of Death, originally broadcast in August and September 1993 and written by the Pertwee era producer, and sometime writer, Barry Letts. 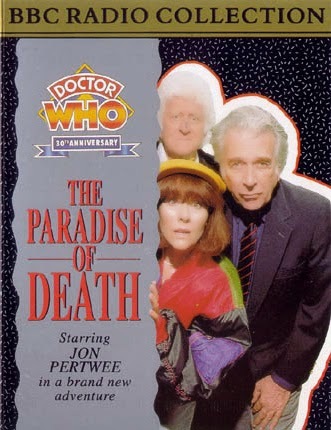 The Paradise Of Death has the Pertwee era written all over it. Echoing Letts own co-written stories, like The Green Death and Planet Of The Spiders, it begins on Earth in London where UNIT is called in to investigate a mysterious death at the soon to be opened Space World theme park, located on Hampstead Heath. Space World, complete with a replica Apollo Saturn rocket as an equivalent to Cinderella’s Castle at a Disney theme park, is backed by the mysterious Parakon Corporation whose chairman Freeth (Harold Innocent aka Gilbert M in “The Happiness Patrol”) and vice chairman Tragan (Peter Miles aka Nyder from “Genesis Of The Daleks”) evoke deep suspicions in the Doctor. Also evoking suspicions are the mysterious ER (Experience Reality) machines. From Space World, and once again echoing Letts co-written Who stories, the story crosses the galaxy midway through as the adventure shifts to Parakon itself, where the Doctor and company discover that this paradise, and the Rapine plant at its heart, aren’t all they appear to be. All three of the returning cast members are superb to say the least. Pertwee, though at times sounding just a bit older, seems to be relishing the chance to play the Doctor again, be it action pieces or the scene in the Corporation archives in the final episode where he gets an appropriately Third Doctor moment of moralizing. Sladen and Courtney are superb as well, sounding like they had never been away from the roles. For those who complained that the Brigadier became a bit of a buffoon as the Pertwee era went on, Courtney proves them wrong as the final episode sees him leading a fighting force that for once isn’t UNIT. It’s a superb reunion of three actors who, for the most part, feel like they had never gone away. The supporting cast also works well for the most part. Peter Miles is as sinister as ever as the sadistic Tragan and, given that Miles performance as Nyder might well be the best henchman performance in all of Doctor Who, he nevertheless makes Tragan feel like a completely different character. Maurice Denham (Azmael in “The Twin Dilemma”) is given the chance to put his talents to use in a much better script, and he's perfectly suited to the role of “blind, old fool” who has let his son chairman Freeth gain too much power. There are also good performances from Jane Slavin and Jonathan Tafler, as well as Letts son, Dominic Letts and Trevor Martin (perhaps best known to Who fans for playing an alternate Fourth Doctor in the stage play of Seven Keys To Doomsday in 1974) voicing a number of different roles. Where the supporting cast is hurt is by the performances of Harold Innocent as Freeth, and Richard Pearce as new companion Jeremy Fitzoliver. Innocent’s performance as Freeth is, to put it mildly, over the top, and he lacks any kind of sinister quality, though this perhaps heightens the performance of Miles. I’m not sure how much of Pearce’s performance can be blamed on him or on the script, as Jeremy comes across as the typical screaming female companion with a twist: it’s a young man instead of a young woman. They hurt an otherwise strong supporting cast. If Paradise has the feeling of the Pertwee era, it’s down to the Barry Letts script. The story echoes the environmentalist tone and questioning attitudes towards corporations witnessed throughout the Third Doctor's TV adventures. “Paradise” at its heart is a story of corporate greed that is all consuming as it takes over not only governments and planets but the very lives of average citizens, or “shareholders” as they are preferably referred to. It is these elements that make the story perhaps more relevant over twenty years later than it was at the time of its original broadcast. There’s more to it than that of course. In the early episodes Letts is able to expand a bit on some of the background of the Pertwee era, such as Sarah Jane’s journalist job (indeed we meet her editor on the Metropolitan magazine) as well as hints of political intrigue involving UNIT and the United Nations. Letts’ script has the feeling of being a Pertwee era Who story done with twists for both the 1990s and the audio format. The Experienced Reality units that are used throughout the story echo the decade’s interest in virtual reality while sequences like the flying herds of bats in the latter episodes are hard to imagine being accomplished on a early 1970s budget. Letts also uses the Experienced Reality to make the otherwise clumsy audio cliché of character’s describing events the listener can’t see actually work for the most part. The script isn’t perfect though as witnessed by the characterization of Jeremy and the story’s occasional dips into melodrama (listen to the penultimate scene of the final episode for example). 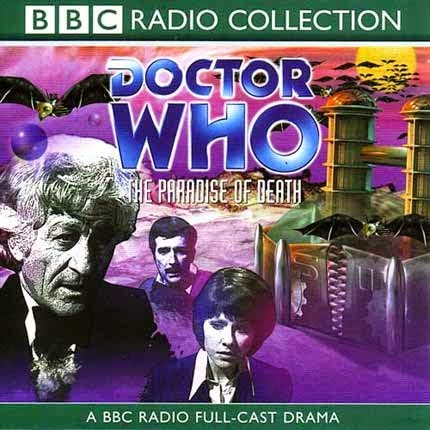 For those flaws though, the tale told here works and, despite a plethora of other Who audios from both the BBC and Big Finish Productions, The Paradise Of Death remains a memorable addition to the audio adventures of the Doctor, if only for being one of only two audio Who stories to feature Pertwee as the Time Lord. Why it’s worth a listen is down to the simple fact that it succeeds in being a faithful recreation of the Pertwee years and yet brings with it some twists for a new era and a new format. And, just like the best of Who, it has a story that continues to be relevant decades on.